hay baby wanna get away on my bison? Katara looks into his eyes and she knows that there's still hope left inside him. The Fire Nation could send an army of fire bending soldiers, a dozen fire benders willing to do whatever the Fire Lord tells them to, but Aang would never lose hope. For awhile, Katara felt hopeless and lost. Everything seemed to happen so fast, and she almost lost him on that day in Ba Sing Se. On nights when they're alone, they hold each other close and give each other hope. He holds on to her tightly, clutching against the fabric of her blue dress. She leaves a kiss on his forehead, right on top of the arrow, and whispers stories of heroes who fell only to rise again. He takes her hand as he guides her down the hall of the Southern Air Temple. When he finally stops, they're standing in front of a door that led to a room. He tells her that this was his room when he was living with the air nomads. Katara breathes in and takes all of Aang that was before she met him. Still holding on to his hand, she guides him gently to the bed. He reacts first, by planting a soft kiss on her lips. It felt like their first kiss, sloppy and inexperienced, but that was because they hadn't seen the other in a long time. She kisses him back, wrapping her arms around his neck as she leans him to lie down on his bed. Everything that came in between happened so fast, but the feelings and memories were still there. She remembers how soft his touch was, how lively he made her feel, and how warm his kisses were on her skin. He remembers her touches, the way she said his name, and how he felt like he was floating in the air. In the end, they became one whole. "...You're going out with my sister?" "Don't look at him like that Sokka!" "You're going out with my sister?!" Aang cleared his throat, "Is...Is that a crime?" "Leave him alone Sokka," Katara protested. Sokka stood there in shock. He looked at Aang, and then back at his baby sister. He didn't even want to imagine the things they've done behind his back. "Have you guys...?" Aang and Katara stood frozen and then looked at each other, before looking back at Sokka with their faces red. "Of course not!" they said in unison. Toph smirked, "I can tell you're lying..."
It took both the force of Toph and Katara to hold him back. She scooted closer towards him, "You should be sleeping. We have a big battle tomorrow..." she remarked silently. Katara watched Aang's expression change to one of worry and fear. She couldn't blame him, because deep down inside she was feeling the same way too. Grabbing his hand tightly, she leaned in closer until her head was leaning against his shoulder. "Shh. Let's just stay like this for now, okay?" She whispered, holding on to his hand tighter. "Who knows what'll happen to us tomorrow, this might be the last time we'll ever get to spend time like this." Aang blushed, and then smiled looking down at Katara. "Okay." Much ♥ for the presents! 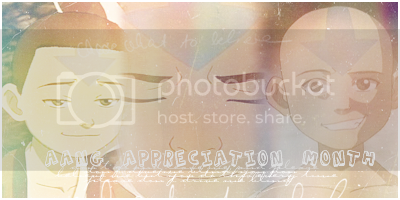 Aang Appreciation Month is every month for me! "Evil is never defeated, merely postponed"
Sig from Avatard: The Last MiSTer; Thanks to wild wolf free17 on fanfiction.net for the quote. Meadow: Thank you! I'm glad you enjoyed it. It's very good! Keep going! @firefists: Thank you! Hopefully I'll have some more drabbles up by the end of the week, or next week. ^^Okay! ^_^ Karma for you BTW! Thanks! I gave you karma back, btw. ^_^ If you'd like, you can check out "Paperweight", which I've also written and is (I believe) in the 2nd page of the fanfiction board. Pwnage, now all it needs is a Zujin one. @firefists: Okay. If you check it out I hope you enjoy it. Your other fanfic was cool! But for now.....PLEASE UPDATE THIS ONE! Here's two more drabbles. I promise the next ones will deal with Zuko/Jin. Aang likes to think about how different his life would've been if he wasn't the Avatar. He remembers way back when he was still in the Air temple and under Monk Gyatso's guidance how he enjoyed hanging around with his buddies. He dreams of days spent meditating in the morning, playing on the air scooter in the afternoon, and watching the stars light up in the sky at night. The temple had a mystic feel to it, and it's a feel he misses right now. His eyes wander toward Katara and quickly feels engulfed by her aura. There was something about her that allured him to her. He remembers waking up and seeing her for the first time, falling endlessly in her deep blue eyes. Ever since then he's never gotten her out of his mind. Her presence is persistent and stubborn, never wanting to leave. If things were up to Aang, then she'd never have to leave. Katara's image could've spent as long as it wanted to in his mind, and the dreams he had of her wouldn't haunt him so much. When he was younger Monk Gyatso taught him to never be distracted by anything, to look forward with a clear mind. That's why meditation was needed, wanted, and required by many. Wisdom was rewarded to those in the end who managed to overcome their distractions, his guardian told him one day. He never asked for wisdom anyway, so he'd rather stay the fool, just as long as he could keep her image in his mind without a sense of duty betraying him. The Avatar was the bringer of peace, and balancer of all the elements. In the time of crisis and war, his duty became greater with each day that dawned upon him. Many people, despite what others see, are quick to judge Aang. They don't see him as the kid that Katara knows best -- goofy, fun loving, and sweet. They just see him as this being called "The Avatar", and not as a human. She thinks it's essential to see the Avatar as Aang the airbending kid. They're also quick to jump on him, and this is when Katara comes in to tell them that although he may be the Avatar, he's still just a kid. He's a human, just like everyone else. She's disturbed by how the nations are quick to place their trust on something they don't even know. Her faith is stronger than ever since getting to know Aang. He's strong, wise, responsible, and kind to all around him. She admires him, and secretly looks up to him. She thinks of him in ways she knows she shouldn't, because the Avatar has duties to the world. But, she doesn't want the Avatar, she only wants Aang. So she extracts that part for herself, places it in her thoughts hidden from everyone else, and keeps the faith that one day she'll be able to love him without boundaries.